Most people when they hear the bells in Taney think they are automatic, but in fact they are rung by hand. Taney is one of only five towers in Dublin where people ring bells. And Taney needs more ringers to keep them going. So maybe you have just retired, maybe you are looking for a new hobby, maybe you have someone who would like to do the An Gaisce awards through bellringing. Come to Taney and try something you have never done before! You can contact Taney bell ringers at iigcctv@gmail.com or 0863570842. Once you know how to ring in Taney you can pretty much ring in any tower that has full circle bells – ie similar to the bells in Taney. When you pull the bell rope, the bell rotates 360 degrees, hence ‘full circle’ ringing. Many of our ringers also ring in St. Patrick’s Dublin, Christ Church Dublin and Drogheda on a regular basis, and sometimes we go further afield. 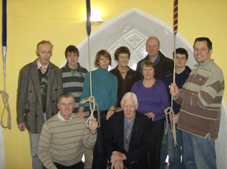 Recently, trips have been organised by the bell ringing community in Ireland to various parts of England. These trips involve ringing in five or six towers during a weekend. In return, we host visiting towers, and in 2017 Taney hosted ringers from Sussex in April and the UK Guild of Clerical Ringers joined us for Monday night practice last September. As well as Sunday ringing and fancy exotic foreign trips, we practice for bell ringing competitions that take place, typically in the March and May time frame. Taney is the current, and proud, holder of the Eastern District Cup and the All-Ireland Cup. We have won the Eastern district competition four times in our short existence, and the All Ireland competition once. The recent Taney Bellringers AGM saw some changes to the officer positions that run the Taney Bellringers Association. Both Darrell Brislane (Ringing Master) and Kate Shearer (Asst. Ringing Master) have stepped down from their positions. We say a big thank you to Darrell and Kate for their stewardship over the past three years. Brian McCann (Ringing Master) and Helen Little (Asst. Ringing Master) were duly elected to these positions for the year(s) to come. We offer a noisy congratulations to Brian and Helen as they take up the mantle. Paul Scott (Secretary), Brendan Donlon (Treasurer) and Joe Kealy (Steeple Keeper) were re-elected to their respective positions unopposed. 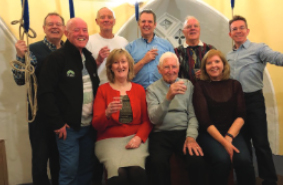 For the third time in a row, the Taney bellringers assembled on a cold 31st December to ring out 2018 and see in 2019 with a usual tuneful noise. The word must be getting around about this new tradition for Taney as we had a number of hardy people turn up outside the church to hear the bells ring in the new year. Next year, we might even invite them in to the tower! At the stroke of midnight, the Tenor (heaviest) bell tolled 12 times after which the full peal of eight bells then rang out over Dundrum for 20 minutes to welcome in 2019. Ringers that night included (L to R in photo) Helen Little, Maria Campbell, Catherine Yeo, Eugene Carr, Darrell Brislane, Paul Scott, Stephen Yeo and Brian McCann. Eastern District Bellringing Striking Competition (Lindoff Cup). On 9th March, the Taney bellringers took part in the Eastern District Striking competition (Lindoff Cup). The competition took place in St. Mary’s in Blessington which has the oldest surviving set of bells in the country. The six bells were installed in St. Mary’s in 1683. With a team consisting of six ringers instead of the usual eight, this allowed Taney to enter three teams, which is a testament to the number of new ringers that have started to ring in Taney in recent times. We are very thankful to Michael Ryan for his tireless efforts at regularly recruiting new bellringers for Taney. Including the three teams from Taney, the competition ended up with nine competing teams, including two from St Patrick’s Cathedral Dublin, two from Christ Church Cathedral Dublin and one each from St Peter’s Drogheda and Blessington. A competition for bellringing might sound a bit strange but it’s a standard part of the bellringing calendar here in Ireland and across the UK. Basically, you are judged on your ability to ring with the six bells in a steady tempo avoiding things like two bells ringing at the same time (clash), two bells with no gap between them (clip) or leaving too long of a gap between them (gap!). This tempo, coupled with the need to call 30 changes (when the conductor moves the bells’ sequence around within an allowed 10-minute time frame), all forms part of what you are judged on. It can get quite competitive! St. Patrick’s ‘A’ team won the competition with Christ Church Cathedral in second place and the Taney ‘A’ team coming third. Third place allows us to go forward and compete in the All-Ireland competition that takes place in late May. In the All-Ireland, the three Eastern District teams mentioned above will compete against each other and the winning towers of the equivalent Southern and Northern districts. Fingers crossed! On Friday 7th September 2018, 11 bell ringers headed off to Surrey for a weekend. Seven of the group were from St Mary’s Cathedral in Limerick and four of us were from Christ Church, Taney. Darrell Brislane’s brother, Kieron, had been busy in the previous weeks organising a busy itinerary for us. On Saturday, we rang in three churches all within a short distance of each other. The first one was St Nicholas, Godstone which is on a narrow county lane about half a mile from the village of Godstone.This beautiful church was restored in the 1870s by a man called Gilbert Scott and as we parked the cars we were immediately drawn to the beauty of the decorative, Tudor-style almshouses next to the church. There were eight bells in this tower and the tenor weighed 12cwt which is quite light. Everyone got a chance to ring the bells. About three miles away was the second church, St Mary the Virgin, an Anglican parish church in Oxted, East Surrey. We arrived on a day when they were having a church open day so we received a very warm welcome. There were church members on duty who were glad to answer our questions about the church and its history. There was a small spiral staircase at the back of the church that led up to the six bells. 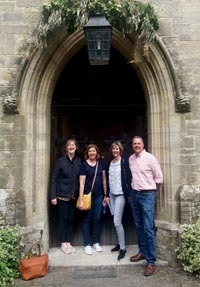 It was good to experience ringing a variety of bells in the towers, although some of us were very keen to get back down those stairs after the bell ringing to sample the delicious cakes and goodies on sale to raise funds for the church. By 12 noon, we were at our next church, St Peter, Limpsfield. An Anglican church that dates back to 1180. While we were waiting for someone to come along and let us into the tower we were given the opportunity to wander around the graveyard and to see the graves of a number of famous musicians, including Frederick Delius (composer), Sir Thomas Beecham (conductor) and Beatrice Harrison (cellist). The tower had six bells and the heaviest (tenor) weighed 15cwt. After our morning ringing bells and travelling from church to church through the beautiful countryside, we were ready for our lunch at the ‘Grasshopper on the Green’ restaurant. The restaurant is beside the Churchill Statue which led us to our afternoon activity of visiting Chartwell, which was Winston Churchill’s home for about 40 years. It is an amazing place. In each room, there were volunteers to tell us about Churchill’s paintings (over 380), writings (55 books) and his life with his family. The rooms are decorated with memorabilia, gifts, the original furniture and some of Churchill’s many books (from his collection of 5,000) as well as honours and medals received by him. The views of the countryside from the terraced lawn are stunning. It was easy to imagine Churchill and his family enjoying this beautiful place. We also had some time to explore the Rose Garden, the Vegetable Garden, and to see the lakes and the croquet lawn. It was such a peaceful place to visit. Before our weekend away, Kieron had emailed us the menu for the restaurant we would be eating in on the Saturday evening. We had a choice of two restaurants and The Bell Inn was chosen. Sure where else would you eat on a bell ringing weekend? There was a table ready for us and the food was served swiftly…pan fried salmon with creamed leeks, thyme-roasted chicken, leg of lamb steak; it was all mouth-watering and tasty. All this was followed by the temptation of Eton Mess or Apple Crumble. This restaurant deserves every good review it gets! On Sunday, we rang the bells in Holy Trinity, Coleman’s Hatch in East Sussex. The bell tower has eight bells and these are rung for all services. The metal rungs of the outdoor ladder leading to the tower are not for the faint hearted and would be a bit tricky to negotiate on a frosty winter’s morning. However, it is worth making it up the ladder rungs to reach the bell chamber, to ring the bells and to see all the history recorded there on the wall plaques detailing peels (specific type of change ringing performance) with over 5,000 changes in three hours. After lunch, our afternoon was spent gong back in time on the vintage steam train at Bluebell Railway in West Sussex. Thankfully our seats had been reserved or it would have been difficult to seat us all together. Each of the stations has been restored to the style of different eras and one of them, Horsted Keynes, will be familiar to those who have watched Downtown Abbey (some of the scenes were filmed there). It was fascinating to go into the steam engine room at the back of the train and to hear about some of the history of the train from one of the volunteers. When our afternoon at the steam trains ended, it was straight to the airport for our flight home. It was a brilliant weekend all round and a great opportunity to ring the bells in different towers.I’m looking forward to the next bell ringing weekend away already! For the second time in a row, the Taney Bell-ringers were able to get a ringing band together on New Year’s Eve to ring out 2017 and see in 2018 with a cacophony of tuneful noise. At the stroke of midnight the Tenor (heaviest) bell tolled twelve times after which the full peal of eight bells then rang out over Dundrum for 20 minutes to welcome in 2018. Ringers that night included (Back Row, L to R) Eugene Carr, Brian McCann, Joe Kealy, Darrell Brislane (Ringing Master), Roy Huber and Brendan Donlon. Seated L to R – Maria Campbell, Cyril Galbraith, and Helen Little. The occasion also allowed us to celebrate Cyril’s birthday hence the glasses of apple juice! The sound of the peal of the bells of St. George's Church has been a familiar one to many Dubliners with the bells of St. George's being immortalised in the writings of James Joyce, author of 'Ulysses'. The Bells were the gift of the distinguished Dublin architect, Francis Johnston (1760 - 1829) who designed St George's Church in Hardwicke Street in 1802. Johnston and his wife Anne resided in Eccles Street, which lay within the parish of St. George and were members of the church. To encourage campanology within the parish he and his wife presented ringing bells to St George's Church in 1828. At the time when the bells were presented in 1828, St George's was numerically the largest parish in the Diocese of Dublin, as Taney parish is today. With the migration of parishioners from the inner city to the suburbs, St George's closed in April 1990 after 176 years of continuous worship. When the church building was sold by the Representative Church Body, the famous bells were not included in the sale. They were carefully dismantled and removed to safe storage. Mr Peter Hayward of Hayward Mills, Bells Consultants, Nottingham, England was contracted to supervise the work. Among those who helped with the dismantling was Canon Desmond Sinnamon, Rector of Taney, who had been approached by bells enthusiasts about the possibility of using the tower of Christ Church, Taney as a new home for the old bells. Taney's youthful congregation had the promise of attracting ringers so ensuring the continuing tradition of bell ringing. The fact that Taney Parish had a major commitment to its Parish Centre development during the 1990's meant the immediate prospect of re-hanging St George's Bells was curtailed. Thanks to the provision of long-term storage space by a parishioner of Taney, George Cooke, the bells were preserved in safety. There was a firm belief that the fundraising challenge to install the Bells could be overcome. Vivien Hood, a member of the Select Vestry, was instrumental in the formation of a committee to explore the project in 1997 and to assess the issues involved, such as planning approval and the raising of the substantial sum that the job would entail - in the region of £60,000. The Rector and Committee asked Dun Laoghaire Rathdown County Council for grant aid and applied for various Millennium, heritage and Better Ireland awards to raise the necessary funds. The Millennium year was seen as the opportunity to make the dream become a reality. A fund raising scheme was launched by the Bells Committee at the Parish Centre in May 1999. Entitled 'A Millennium Opportunity', the scheme targeted the corporate sector and local businesses urging them to become involved in a unique Millennium restoration project by contributing either towards the overall cost or in sponsoring individual bells. The aim was to have the bells installed in Taney Church Tower in time to ring in the third Millennium of faith as a symbol of thanksgiving for our Christian Heritage and dedication to another era of faith. There was a magnificent public response to the launch. A flood of letters and subscriptions were received from people at home and abroad who heard about the project. 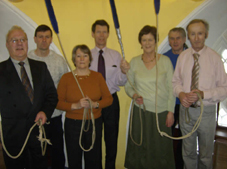 The Select Vestry gave the go- ahead to the Bells Committee to proceed and in September 1999 the Taney Change-Ringers Association was founded under the guidance of Cyril Galbraith, the first ringing master, with the support of ringers from St George's, St Patrick's Cathedral, St Audoen's and John's Lane. It was a race against time to get the tower ready, to hoist and install the eight bells and to construct a new ringing gallery in time to ring in the New Millennium. It was an enormous job. The workmen described the stonework in the tower as the hardest they had ever encountered. Cyril Galbraith, Alan Hamilton and their team literally worked day and night to ensure that the Bells would be ready in time for the Millennium moment. Few people present on the night of the 31st December 1999 will ever forget this most moving occasion as over a thousand people thronged in the Parish Centre and Church grounds to see in AD 2000. Cyril Galbraith, Ringing Master of Taney Change Ringers Society accepted a presentation on behalf of Taney and St George's Change Ringers who made their way to ring in the New Year to the huge cheers of the people. A short service to mark the millennium moment was conducted by the Rector, Canon Desmond Sinnamon, the Curate, Rev Bernadette Daly and the Parish Priest of Dundrum, Fr Donal O'Doherty. On Sunday 26th November 2000, the Archbishop of Dublin presided and preached at a memorable service of dedication of St George's Bells in Christ Church, Taney. The bell ringing chamber, the sound proofing, the refurbishment of the porch and the new electrics in the Church were all ready and the occasion was further enhanced by the presence of bell ringers from all over the island, North and South, who pealed the bells as they called us to worship. It is a call that will ring throughout this third millennium of faith.